Does anyone remember when I wrote about meeting the woman pictured below? It was my last night in Atlanta before flying back the next day to England. Well, if you missed it and would like to know what the Pioneer Woman and I talked about, you can read all about it here. This post is just a little thank you note to Ree Drummond for sending 2300 of her blogging buddies by yesterday to have a look around Gifts Of The Journey. They were such a quiet crowd that I might not have noticed they were here if I had not seen my sitemeter numbers spiking so quickly. I’ve never had a party where so many folks stopped by and a party is exactly what it felt like here as I watched my numbers rise. This morning was just a memory though with nary a scrap of anything left behind except a nice comment from Rebekah who was at the Atlanta gathering with the other 800 or so of us. If I had know they were coming, I might have made a batch of Ree’s famous cinnamon rolls for everyone like I did for some of the folks in my village on Christmas Eve or maybe shared stories about how well my her stuffing tasted with our Christmas dinner or I might even have shown pictures of all of the blackberry cobblers I made and gave away to people here who had no idea what a cobbler was. As it was, I felt slightly unprepared and could only shout throughout the day to my husband John saying, ” I’m at 902, 1106, 2001…,” and so on while whispering a little thanks for stopping by as I saw folks departing. Seriously, thanks to everyone who took the time to visit and I hope you come back again when you can stay a bit longer. Oh, and if you’re looking for some horses and cows like PW has hanging around her place, I’ve got some of those you might like roaming free on the moors and other places around here. This entry was posted in Bloggers, Cooking, Cornwall and tagged Atlanta, Blackberry Cobbler, Book Signing, Cookbook, Cows, Elizabeth Harper, Gifts Of The Journey, Horses, Moors, Pioneer Woman, Pioneer Woman's Cinnamon Rolls, Pioneer Woman's Cornbread, Ree Drummond, Thank You Notes. Bookmark the permalink. I was one of those visitors yesterday and I had a great time at your party. Despite of all the other things I had to do, I was mesmorized by your blog so much so that I had to read the entire thing. I am a happy, 40 year old, stay-at-home mom who struggles with the “what if’s” in life. I am always reminding myself to look forward but often feel tied down by the trappings of my life. You have taken a path that seems so risky and daring. Your storytelling lured me along wanting to know what you are doing next. Of course, today I’m back to the real world of someone else’s schedule :):getting two teens back to middle school and homeschooling an autistic boy who is either pure joy or raw anger and nothing in between. Wow, that’s a lot of visitors! I’m sitting here waiting for the delivery of my Pioneer Woman Cooks book, which I ordered from Amazon, apparently it was dispatched on Thursday so I’m getting impatient now:) I don’t know if it’ll help much with the New Year’s diet though! I just read your post on FB to PW. I, too, got to meet her and I thought I was meeting a celebrity…maybe you will become the next blogger celebrity because of all the numbers you had yesterday. What a great idea to give her a thank-you!! By the way, I like your blog and will put it on my Blog Favorites list. I, too, have a blog. http://www.lynettesideas.com . Come on by sometime and have a look around. Hello. I wandered in via PW and had a look round. I have a cousin who lives in Devon. It feels to me as if you’re ‘right next door’ to her even though you’re not. But, as I live in California, you’re closer than I am. Most of my extended family live in various parts of the UK. I read several UK media sites as well as a couple of blogs. I love to look at the photos. It somehow makes me feel closer to family. Heidi – Welcome and thanks so much for coming back after the party blew through. It’s so nice to have a chance to hear from one of party girls. Thanks too for your kind comments about my blog and my storytelling. You sound like a writer yourself especially in the way you described homeschooling your son, ” an autistic boy who is either pure joy or raw anger and nothing in between.” I hope you’ll come back. 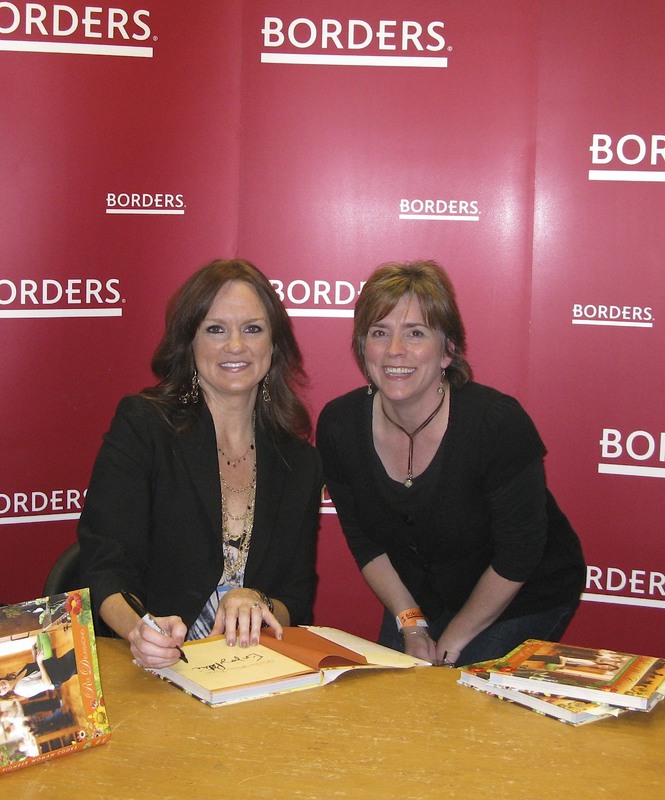 Yvonne – I can’t tell you how cool I think it is to find another Pioneer Woman fan right in our little village. What are the odds of that? After seeing the sweet dessert you posted on your blog tonight, I think you’ll really enjoy her cookbook. We’ll have to compare notes when yours arrives. Jenneu – It’s always good to hear from you and how sweet that you were coming by to alert me. Meeting her was a lot of fun even with the long wait although mine was only three hours … and I was so impressed that she was there until everyone who stayed left with a signed book. She was friendly and down to earth just like everyone says. John was as pleased as I was with the amount of traffic that blew through here. Of course, John likes to say, he’s my biggest fan and is always happy to see other people appreciate my blog. I actually had another 1200 + yesterday and today has been pretty exciting as well. Jillian – Welcome…I’m so glad you stopped by and thanks too for adding me to your blogroll. I just need to figure out how to find you. Darlene – So glad to see you here and after taking a look around your space I may be calling on you for a question or two about knitting. My daughter taught me while I in Atlanta for Thanksgiving and I have already forgotten since I put it down until after Christmas. You look like a pro though who could talk me though my memory gap. Sandybee – Welcome to GOTJ. I’m so glad you stopped by especially since you have family in the area. You’re right about Devon being right next door. My husband John just said we are only 20 miles from Devon. We’ll have to meet at our village pub when you come to visit. Sarah( who commented above) and I met through my blog and I had a lovely time with her and her sister Suzanne when they came this way. I have lived in several parts of California at different times in my life and I’m curious as to which part of CA you call home. Thank you for replying. I live in the east county of San Diego although I grew up on the coast (Point Loma). My parents left London when I was about 1 1/2. We came to San Diego via Toronto and Hollywood about 55 years ago. My Dad’s brother moved to Devon. He and his wife lived in Bideford until they died. His daughter and her husband live in Swimbridge for part of the year and travel the rest of the time. I’ve been to Devon several times and absolutely love it. It’s a beautiful part of the world. As I said before, I went back to read this blog from the beginning and enjoy it as much as PW’s blog. I have a love of England which you are boosting! I have only visited there twice but wish to come again!